A crown is used to restore a tooth’s size, shape and strength. It surrounds any remaining portion of the original tooth and is permanently bonded in place. Properly maintained, a crown can last a lifetime. Solid gold - traditionally used for molars, gold is a flexible, long-lasting material that is perfectly suited for heavy use areas. Porcelain fused to Metal (or PFM) – a crown traditionally placed in medium use areas such as your premolars. This type of crown is fairly versatile as it is made of a strong metallic core with a porcelain exterior for aesthetic purposes. The porcelain shade matches your existing teeth, and can be adapted to molars when appearance is a concern or used for front teeth in situations when a heavier or deeper bite is a concern. Solid Ceramic — these crowns are frequently used for front teeth, as the shade and lustre are truly outstanding. These crowns have no metal core to affect their shade and are usually indistinguishable from natural teeth. Usually two appointments are required for a crown. At your initial appointment, your dentist will prepare your tooth – shaping it and taking an impression. This impression is passed along to our laboratory team (along with the shade of your surrounding teeth), who take approximately two weeks to manufacture a perfectly shaped and well fitting crown, which will be cemented at your next appointment. We use only the best local laboratories from Brisbane and the Gold Coast region for crown production. We never send our laboratory work overseas – we prefer to use highly trained and experienced Australian laboratories and work closely with them to get the best result. International studies have determined the average life of a crown is around 10 to 12 years. However, as with all dental treatment, the level of hygiene and routine dental maintenance contributes significantly to the success of your dental treatment. Crowns need to be cleaned and flossed regularly to ensure you obtain an optimum result. 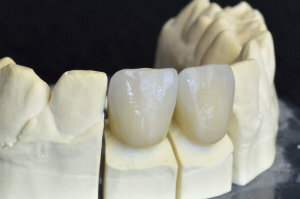 Dental bridges are used as a permanent solution to bridge a gap created by one or more missing teeth. Bridges are designed to look and feel like your natural teeth and allow you to function normally again when eating, smiling and living your life. Bridges are cemented by your dentist and can only be removed by dental professionals. Bridges need to be cleaned by brushing and flossing carefully every day to maintain their longevity. Your dental professional can help you establish a suitable oral hygiene routine that will add years to your smile. Dental implants serve as replacement roots for either permanent or removable replacement teeth that are created to match your natural teeth. The benefits of dental implants include an improved appearance, self-esteem and oral health as well as making it easier for you to eat and speak. Implants are durable; with the proper care, many last a lifetime. 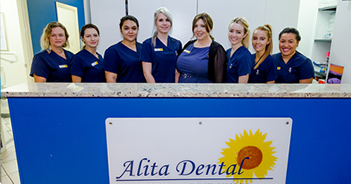 We offer two types of dental implants: removable and permanent. Removable prostheses are most commonly called dentures. For people with traditional full or partial dentures, retention can often prove a challenge, particularly in cases where minimal bony ridges exist on the lower jaw. Two to four implants placed in the lower jaw with magnetic attachments or buttons to ‘lock’ a lower denture into place can have a profound impact on the comfort and function of a lower appliance. Similar results can be achieved with dental implants in the upper arch. Fixed prostheses look and function like your natural teeth. These dental implants are usually inserted in three stages over a period of 12-16 weeks; however, this may vary depending upon your situation.